By Linda Qiu on Tuesday, August 26th, 2014 at 9:58 a.m.
Herman Cain on "Varney and Co." on Aug. 11, 2014. Earlier this year, President Barack Obama asked Congress to raise the federal minimum wage to $10.10, following a national conversation about wages and income inequality. But according to 2012 Republican presidential candidate Herman Cain, a higher minimum wage isn’t enough, since the real value of paychecks hasn’t budged in four decades. 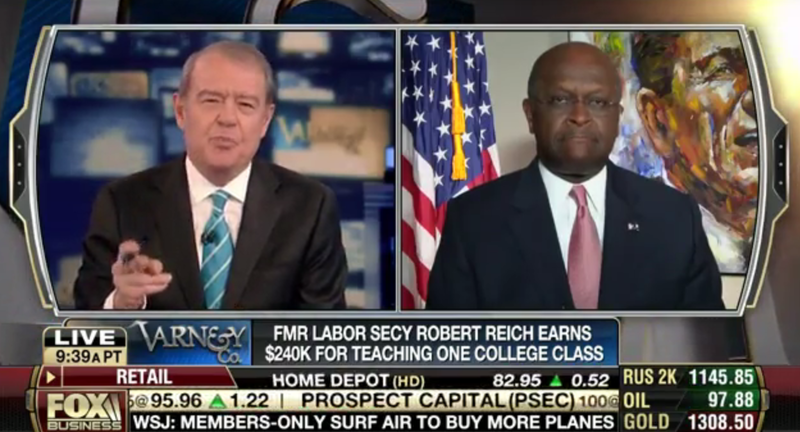 Appearing on Aug. 11’s Varney and Co. on Fox News Business, Cain criticized former Bill Clinton labor secretary Robert Reich who blamed a rise in income inequality on the financial elite. Cain told host Stuart Varney it’s the Federal Reserve that is responsible. "This is a fact, Stuart, over the last 40 years, real wage growth has been flatlined because of the policies of the Federal Reserve," Cain said. "It had nothing to do with greedy CEOs, nothing to do with what companies wanted to do. It was all driven by the Federal Reserve trying to control unemployment with the faulty control of wage growth." We wanted to see if real wages -- which is a worker’s salary adjusted for inflation -- have indeed seen no growth for four decades and whether that could be tied to Federal Reserve policies. Cain’s research associate Rich Lowrie, his former economic adviser and one of the creators of Cain’s 9-9-9 tax plan, referred us to this video. The video takes its data from the World Top Incomes Database, a project of leading economists whose calculations are based off of income tax records. As for the theory that the Fed’s policies are responsible for real wage stagnation, that was Lowrie’s and other Cain researchers’ independent conclusion. "We think it’s unmistakable that there is a connection," Lowrie said. For this fact-check, we talked to Lowrie, researchers at think thanks with various political leanings, and a number of independent economists. What we found was that this claim is about competing theories on labor economics and monetary policy. Cain's viewpoint is an outlier. We’ll start by assessing Cain’s claim that real wage growth has flatlined over the past 40 years. Later we’ll talk about the role of the Federal Reserve. Cain got the stat after analyzing data from a reputable source, the World Top Incomes Database. Between 1972 and 2012, real income has grown by an average of 0.52 percent from year to year. Paltry growth, but growth. Lowrie, a corporate financial adviser, said Cain was focusing on a group Lowrie called the "striving majority," the bottom 90 percent of American wage earners. Real income for that group has actually decreased annually at an average 0.16 percent, according to the World Top Incomes Database. As you can see, income growth hasn’t literally flatlined -- it’s bounced up and down a bit. Real income growth was the most stagnant in the 1970s, but saw some gains in the 1990s before falling in the 2000s. Cain "just ignores the ups and downs," said Mark Bils, a professor of macroeconomics at the University of Rochester. "Forty years is a long span." And average incomes, even adjusted for inflation, don’t capture the differences in working conditions between 1972 and today, according to Bils. Working hours are different and purchasing power has risen. What happens when we focus on wages? Josh Bivens, research and policy director at the liberal think tank Economic Policy Institute, looked at real wage growth from 1979 to 2013, using data from the Bureau of Labor Economics. The results show that Americans who earn less have seen very little wage growth while top earners have made gains. For the 70th percentile workers (those who make more than 70 percent of all workers), hourly wages saw virtually no growth between 1979 and 1995. The years 1995 to 2000 were an exception, with an annualized growth rate of 1.4 percent. So in sum, if you factor in inflation, the average American has been bringing home the same amount of bacon for the past four decades, while the economic elite earn more from year to year. That doesn’t necessarily tell the entire story, economists told us, noting that wages do not factor in things like health benefits, tuition assistance, vacation time and sick leave. But by Cain’s yardstick, he is largely correct. Cain, however, did not simply say wage growth has flatlined. He blamed the Federal Reserve. That view is an outlier. According to Bivens, the claim is "not very grounded." John Makin, a former economist at Federal Reserve banks in Chicago and Atlanta currently at the conservative American Enterprise Institute, and University of California, Berkeley labor economist Michael Reich said they have not seen any research that ties Federal Reserve policies to real wages flatlining. Both Makin and Reich (a colleague of Robert Reich’s, but no relation) pointed out that neither Cain nor Lowrie are economists. At best, the Federal Reserve has "a marginal effect on the long term trend of real wage growth," said Kenneth Rogoff, author of This Time is Different and a professor economics and public policy at Harvard University. Though economists don’t give much credence to the general claim, they helped us dissect Cain’s theories, which boil down to how the Fed affixes the value of the dollar, how the Fed sets interest rates, and how the Fed defines and measures inflation. Cannot directly affect real wages, which is determined by largely nonmonetary factors. Treat real wages as inflation, thus intentionally kept stable. Keep inflation down and thus real wages as well. Use the personal price expenditures index largely, as well as many other indices, to measure inflation. Use the Consumer Price Index (CPI) to measure inflation, but in reality substitute real wages for the CPI. Do not target the exchange value, but take into account the effect of the dollar on the U.S. economy. Used to measure inflation, keeping the value stable. Now float the dollar, letting the value fluctuate. Lowrie pinpoints 1971 as the year when real income began to flatline, which is also the year when the United States stopped tying its currency to gold. The theory goes that when the dollar was backed by gold, real wages were growing increasingly; and when the gold exchange standard was nixed, the dollar began to float -- subject to fluctuation on the foreign currency and exchange markets -- and wages flatlined. With a stable currency, material costs for businesses flatlined and thus rose wages, Lowrie said. This is the debased currency argument -- a floating dollar has less purchasing power, leading to inflation and thus depreciating real wages -- and one virtually all economists are skeptical of. At best, the theory is "hand-wavy," according to Bivens. "You would really need to see an increase in inflation for this to make sense, and that’s not the story of the past decades for sure," he said. What’s more, the value of the dollar is largely under the U.S. Treasury’s purview, not the Fed’s. According to Lowrie, the Fed will lower interest rates when the economy is expanding, making it easier for businesses to borrow money and boosting wealth. When the economy begins to contract, the Fed raises interest rates to curb inflation but instead leading to less investment in business and thus a decrease in wages. Lowrie's description of interest rate policies sits well with economists. Bivens said that the Fed is certainly "quick on the trigger" when it comes to enacting policies that heat up and cool down the economy, potentially affecting wages immediately. But the idea that policies have a direct or even significant impact on real wages is a tall order, experts said. "Productivity has grown steadily over the postwar period, but only since 1980 have real wages failed to grow with productivity growth. Interest rate policy has not changed during that period," Reich said. While it’s true that higher interest rates generally increase unemployment and slow nominal wage growth (not adjusted for inflation) in the time immediately following the hikes, they don’t do much for real wages, according to Reich. "Over 40 years, it’s not going to matter," said Bils. "Maybe they create some asset run-rups in the short term, but it doesn’t follow that wages would decrease." Lowrie’s third point suggests that the Fed treats real wages as inflation and attempts to keep growth down to keep inflation down. Lowrie said the Fed uses lagging data, namely the CPI, to measure inflation but because the data doesn’t reflect the market in real time, the Fed defaults to using real wages as a proxy. Since part of the objective of the Fed is to stabilize prices, they stabilize real wages instead. Economists take issue with the characterization of how inflation is measured. The Fed focuses on general rises in prices, not wages, to evaluate inflation, but to predict inflation, other factors like GDP growth and unemployment are also taken into account. Bivens compared it to baseball projections. "Looking at strikeouts and walks is a better predictor of wins than past wins," he said. And according to Makin, the very definition of inflation means that real wages can’t be its proxy, because doing so would discount the other part of the equation -- wages. "Real wages are nominal wages adjusted for inflation," he said. "If the Fed caused the price level to rise more rapidly, then prices would rise faster than money, and real wages would go (down) fast. If prices rise slowly, then real wages would go up." In other words, in order for real wages to grow, nominal wage growth would have to rise faster than inflation. Since inflation has been below the Fed’s goal of 2 percent, it’s the lack of nominal wage growth that’s keeping real wages down. If it’s not the Fed, what’s actually been holding real wages down? Economists attribute it to many factors. An economist at the Fed itself wrote that labor market conditions are to blame. Bils listed changes in technology, risk taking and investing, and human capital. There’s also increased international trade, fluctuating demand for different skill levels and income tax policy, said Stephen Moore, a former senior economist at the congressional Joint Economic Committee who now works at the conservative Heritage Foundation. Makin and Biven pointed to a rise in labor productivity combined with a weak demand for labor. And Reich said all of the above: increased competition from low-wage countries, technological change that has reduced the need for jobs in the mid-level pay scales, while encouraging growth in low-paid occupations, the decline of unions and the decline of real minimum wages. "While professional economists' opinions on the relative importance of each of these varies, I have never seen a statement that Fed policies regarding inflation are at all a factor," Reich said. Cain said, "Over the last 40 years, real wage growth has been flatlined because of the policies of the Federal Reserve." Cain’s research associate was looking at real income growth, but the findings are consistent if you measure income or wages. In short, wage growth has remain relatively flat. But Cain goes too far in blaming policies of the Federal Reserve, both conservative and liberal economists told us us. Various nonmonetary policy factors are much more likely to cause a lack of wage growth. Cain’s claim contains an element of truth but ignores critical facts that would give a different impression. We rate it Mostly False. Published: Tuesday, August 26th, 2014 at 9:58 a.m.